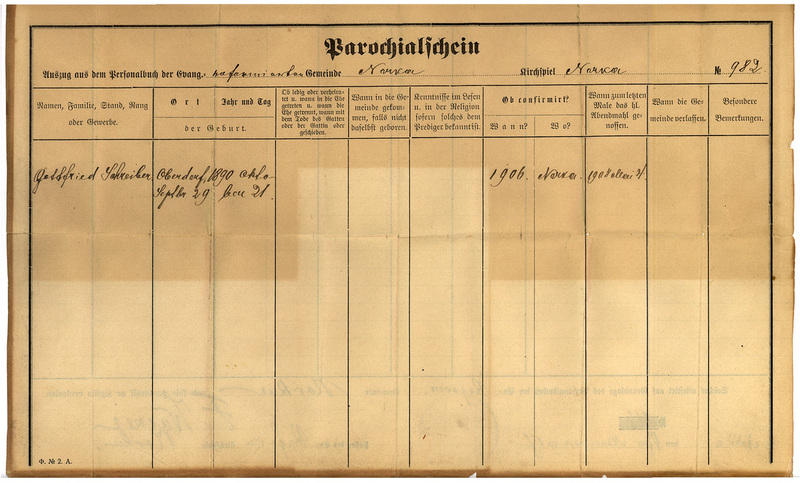 A Parochialschein (Parochial certificates) was an official document provided by the Lutheran and Reformed pastors to families moving away from their home church or parish. The parochial certificates for the Volga Germans are generally written in German or Russian or both. Front and back of Gottfried Schreiber's Parochial Certificate signed by Rev. Wacker on November 17, 1907. 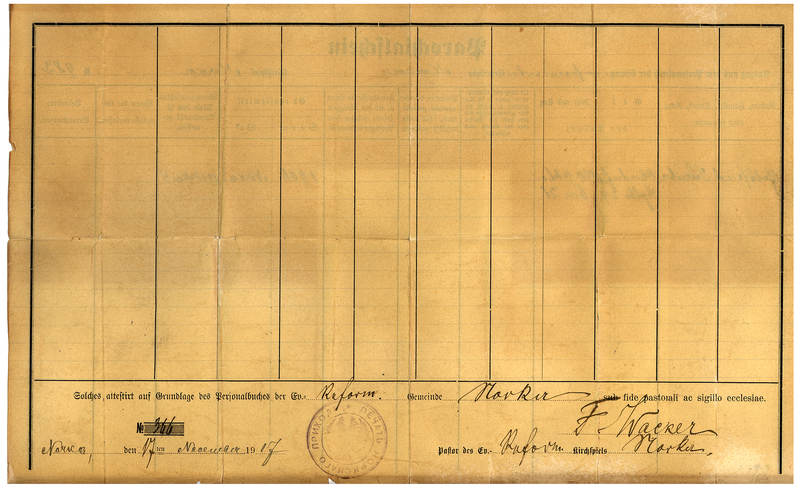 Gottfried immigrated to the United States where he joined his two brothers in Portland, Oregon (see their certificate below). Courtesy of Steve Schreiber. The purpose of the Parochial Certificate was for the "sending" pastor to tell the "receiving" pastor or church in the new country that this family was in good standing, having been baptized, married, regular communion, etc. 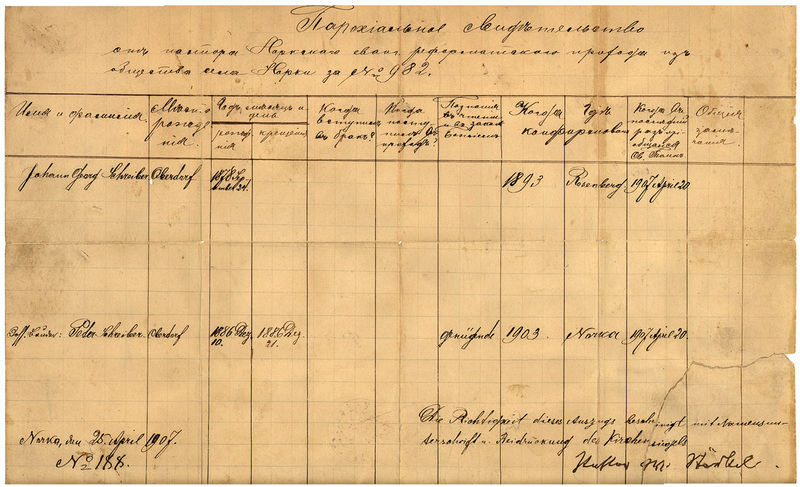 This document would be called a "Letter of Transfer" today. Most churches required that those seeking to be married be confirmed and members of the church and the Parochial Certificate documented that fact for those who had emigrated. The Parochial Certificate of Johann Georg Schreiber and Peter Schreiber, signed by Rev. Wilhelm Stärkel on April 25, 1907. These two brothers immigrated to the United States and settled in Portland, Oregon. Courtesy of Steve Schreiber. The information provided on the certificate generally includes the date and place of birth, date and place of confirmation and the date of the last communion taken. The certificate is always signed and dated by the pastor of the "sending" church.